Like many riders racing runs in the family with Conor’s father, Billy, having competed in the TT and having only recently retired. Billy’s highest placed finish at the TT came in 1985 in the Production 100-250cc where he placed 28th, the race also included stellar names such as Robert Dunlop. He was a more regular runner at the Manx GP and Classic TT where his highest finishes were 12th at both events. Starting out on the track, Conor found his opportunities were limited which saw him make the change to road racing. However, he more than made his mark on the short circuits and, having scored podiums in the Virgin Mobile R6 Cup, he became a regular top six finisher in the highly competitive British Superstock 1000 Championship. At the age of 20 though, he decided to make his debut on the roads and after a successful North West 200 meeting in 2006, he then won the coveted Newcomers Trophy at the TT. Coming from the Isle of Man, Conor grew up watching the TT races from the banks, which certainly influenced his decision to turn to road racing and get involved in the race around the island. His impressive debut at the TT in 2006, saw take 22nd in the Superstock race before taking his best finish, 17th, in the Senior race, which also saw him break the magical 120mph barrier. Conor then went on to compete at the Ulster Grand Prix where he won Newcomers race, becoming the fastest newcomer that year at Dundrod, just as he had been at the North West 200. The seeds had been sewn and it was clear he had what it took to compete with the best. Conor’s first race bike was a pre-owned Honda RS125. Growing up on the Isle of Man, Conor’s favourite course has to be the TT! As previously mentioned the way Conor burst onto the scene in 2006 was a great achievement, especially for someone so young, and it gave him the platform he needed to kick on in road racing. He has been quoted as saying his first TT podium in 2009 is his standout moment, coming from the Isle of Man and watching the races as a youngster made it all the more special. 2009 was the year Cummins placed 2nd in the Senior TT and 3rd in the Supersport TT Race 2. Conor was a key feature in the hit documentary TT3D: Closer to the Edge, which followed the 2010 TT closely, in which Conor achieved 3rd place in the Superstock TT after being cruelly forced to retire from the Superbike race whilst leading. The documentary features Cummins’ chase of Ian Hutchinson in the closing Senior race, which saw him lie in 2nd place, only three seconds behind the eventual winner. However, this chase was ended when Conor had a huge crash at the Verandah all captured on TV, which resulted in him being air lifted to hospital. Despite suffering serious and potentially career-ending injuries, Conor fought back and miraculously returned to the TT a year later where he took a best finish of sixth. In 2013, he was back on the podium coming 3rd in the Lightweight TT and 2014 saw him match his best TT result, placing second in the Senior TT, with the race being won by Michael Dunlop. Cummins has also impressed away from the TT, winning the Dundrod 150 Superbike race in 2009, which saw him become the fastest man in the world. Indeed, the Dundrod circuit has seen some of his finest moments with 11 podiums having now been recorded at the high-speed event. In more recent times, Conor has launched his own mobile barista service named ‘Coffee Man’, next time you visit the island be sure to try some of Conor’s coffee! 2018 has been described by many as Conor’s best since the famous TT crash in 2010 and the year started well at the North West 200 where he took fifth and sixth in the two Superbike races and sixth and seventh in the two Supersport encounters. Cummins took his impressive form at the North West 200 to the Isle of Man TT, finishing 5th or higher in each of the races he completed. Achieving two podium finishes, Conor’s best result came in the RST Superbike race, in which he was runner-up behind Michael Dunlop. In this race Cummins’ set a new personal lap speed of 132.589 mph riding a 2017 Honda CBR1000RR. 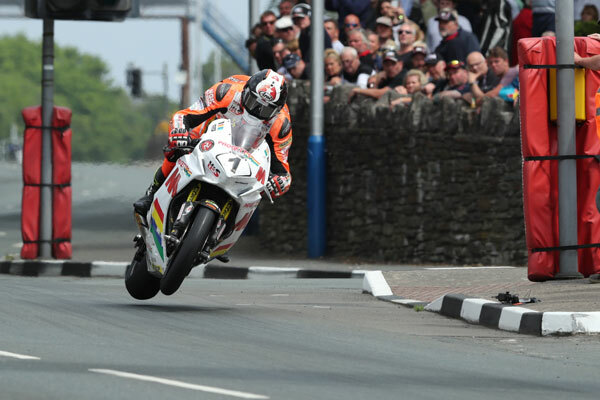 His other podium finish came in the Senior TT race in which he had an average speed of 129.554mph and trailed only to Peter Hickman and Dean Harrison in what was a hotly contested race. Aside from this, the 2018 Isle of Man TT saw Conor take 5th in the Supersport 1 TT and 4th in the Supersport 2 where he also posted his best ever lap speed in the 600cc class with a speed of 127.268mph on the Padgetts Honda. Cummins was not done for the year yet, heading to the Ulster Grand Prix in fine form he looked impressive in qualifying, setting a new qualifying lap record at 134.138 mph. He then followed this up by winning the first Supersport race at Dundrod, his first Ulster GP win in nine years. Conor recorded 3rd place finishes in the Superstock and second Supersport race, and although he was leading the Superbike race, unfortunately the Manxman crashed out, although the good news was he was uninjured. Another podium finish came in the RST Superbike Classic TT, where Cummins rode a Yamaha YZR 500 and finishing third behind Dean Harrison and Horst Saiger capped a very successful year.